I just can’t wait to see what a particular quilt is going to look like so I took a break from making blocks to put this green section together. This is a UFO that has been redesigned so I’m using the half square triangles I already have cut. You could control the scrappiness of this quilt by using a single green fabric but luckily I like scrappy. By the way, I don’t know if I made myself clear the other day but I had decided NOT to use this heart layout or any of the others I tried and to use the Half Square Strings design again – as you can see I changed my mind – again! I’m working my way through my list. I’ll load another one this afternoon for quilting. Two HeartStrings tops are packed and ready to ship to 2 girls whose family lost a lot of their belongings in a house fire. I’m surrounded by HeartStrings Projects today and couldn’t be happier! One ready for the binding to be hand stitched down. Two bound, labeled, and washed to be put in the chest for donation when needed. Two in the bottom box ready to be shipped out along with a small box of strings for another member. Wooo hooo, talk about progress! Way to go Mary. You are on a ROLL! Love the Cc with the red binding – it’s a really nice finishing touch. The new heart design is really nice too! boy, you’re a busy beaver!Love the red binding and the new blocks look good too. I’m impressed, Mary!It must make you feel really good seeing so much tangible evidence of your efforts. This is an amazing project, I applaud your vision. Wow! firing on all cylinders! You are doing sooo well! Such a lot of eye candy at your place! Love the red binding. I love the red binding!!!! 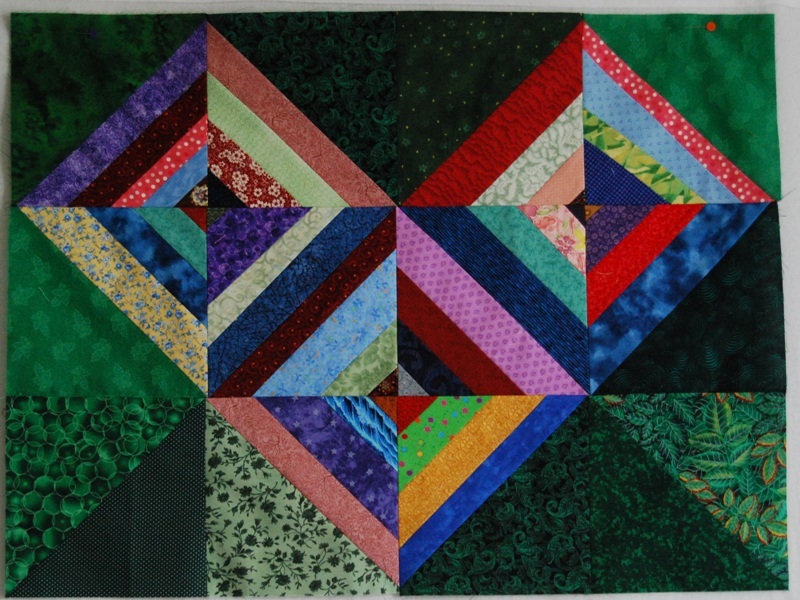 I am really glad that you changed your mind on the heart design, I really like it and I think I am going to try it for Judy’s August Challenge. You are amazing with all that you get done, you inspire me!!! Wow, you are really making progress. And the quilts are great. Guess I’d better get busy! LOVE the colors and I know you’re savoring the progress. Thanks for sharing the photos! You are so productive. And so neat while doing it all!! If that was me there would be bits and pieces all over the place LOLThe red binding looks great. These quilts are a great inspiration for my personal project of helping my local Linus – thank you.